Saving your Live Sets correctly will help you avoid the danger of accumulating a disorganized amount of files, samples, data, projects and Live Sets that can very quickly lead to chaos and decreased computer performance. 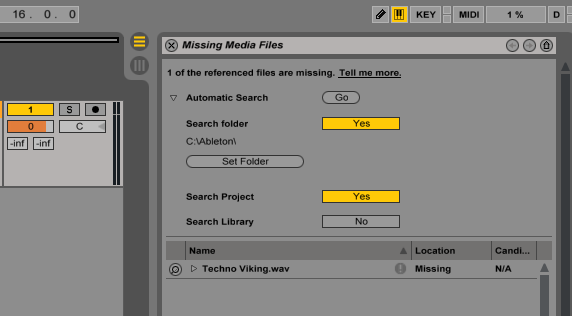 Here are a few aspects to consider in regard to file management in Ableton Live. "Save Live Set" overwrites the currently open Live Set and keeps the same name. "Save Live Set As..." allows you not only to choose a new name, but also a new location for this Set. It is important to understand the difference between a Live Set and a Live Project. A Live Project is the folder which contains the Live Set(s), and all related files. It is the container for a particular piece of work, in most cases a song. Every piece of data you need for this particular song can be saved within the Project folder. The Live Set itself is the file you click on to open your song - it ends with the file extension .als. 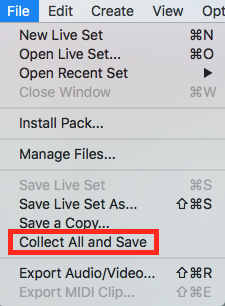 Each Live Set you create should be saved in its own individual Live Project folder. You shouldn't save multiple songs or Live Sets (.als files) in the same Project folder. Saving multiple different Live Sets inside the same Live Project folder will cause critical file management issues, and can slow down Live significantly. Live will create a new Live Project folder when you save a Live Set for the first time. Make sure that this Project folder is not saved inside an existing Live Project folder. Conclusion: It is usually recommended to save new projects under a new name and in a folder location outside of any other Project folder. Note: The User Library is a Live Project itself. Saving your Live Sets into the User Library is therefore not recommended as it will only create an .als file, but not the entire Project folder and lead to problems when e.g. trying to find missing samples. It can be tempting to add the entire sample library to "Places" in Live's Browser. This is not recommended however as it will slow down the computer due to necessary scanning processes. A better way is to add the sample library to the Samples folder in User Library. By moving around samples inside the User Library, file references will be kept: you can add folders and organize your samples any way you like. Managing all the presets and making sure that all the referenced samples are stored inside the User Library is quite easy. Click File→Manage Files→Manage User Library to see an overview of all the presets, files, clips and sets stored in the User Library. Click the orange Status Bar to bring up the File Manager View. Now, you can set Live to automatically search for the missing files. Tip: In case you know the folder location of the missing files, simply click "Set Folder" to choose that folder and make sure "Search Folder" option is set to "Yes". This should speed up the time it takes to locate the missing samples.